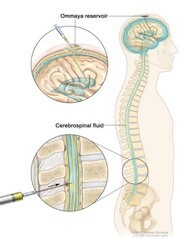 Intrathecal chemotherapy; drawing shows the cerebrospinal fluid (CSF) in the brain and spinal cord, and an Ommaya reservoir (a dome-shaped container that is placed under the scalp during surgery; it holds the drugs as they flow through a small tube into the brain). Top section shows a syringe and needle injecting anticancer drugs into the Ommaya reservoir. Bottom section shows a syringe and needle injecting anticancer drugs directly into the cerebrospinal fluid in the lower part of the spinal column.